I still haven't found the time (or the energy) to compile the rest of the photos & video for the "Halloween with the Baums Part Deux" post, so I thought I'd go back to Meal Planning Monday. Instead of featuring a recipe (and because I am trying out some new ones this week), I thought I'd just link to the recipes that I'm using for the week. Actually, I guess I can't link to a couple of them, but if you want them holler and I'll post them another time. Mmmmk? 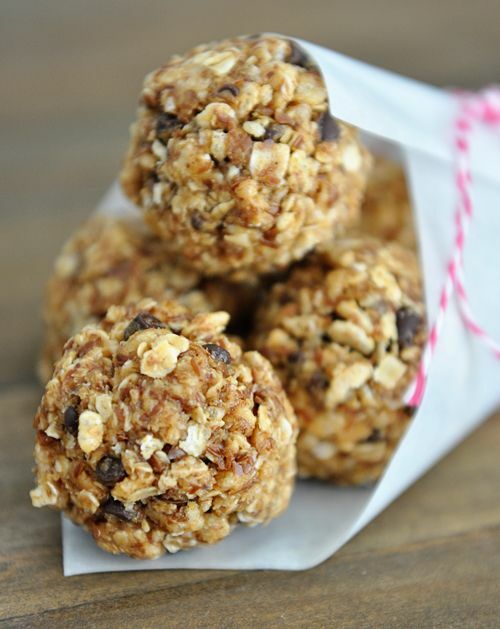 No-Bake Healthy Granola Bites - This was the first time I've made these, and they're pretty good - super easy and a good thing to grab on the go. Unfortunately, I can't send them to school since school is nut-free and these call for peanut butter, but Lilly (shockingly) loved them and asked for more when I tried them out on her this morning. Dinners (and lunches because we always have leftovers! ): I have been excited about the changing weather because I've been able to add some of my favorite fall/winter recipes into the rotation as well as try out some new ones. I assume that if I haven't mentioned it already y'all have picked up on my LOVE for all things Mel's Kitchen Cafe*. Half of my meal planning battle is coming up with inspiration and trying new things to spice up our meal routine. I have tried quite a few of Mel's recipes recently and have loved every single one - and so has my husband, which says a lot. I made this one tonight because Dan is out of town and he maintains that he "doesn't like pot pies" but I am here to tell you that he seriously missed out. It's not even really like a pot pie - for one thing, there is the addition of celery, and for another there is a really intense variety of flavor - there's cayenne pepper in the crumble topping that adds a lot to this dish. Anyway, the point is, do yourself a favor and try it. I honestly almost made myself sick from eating so much of it tonight. 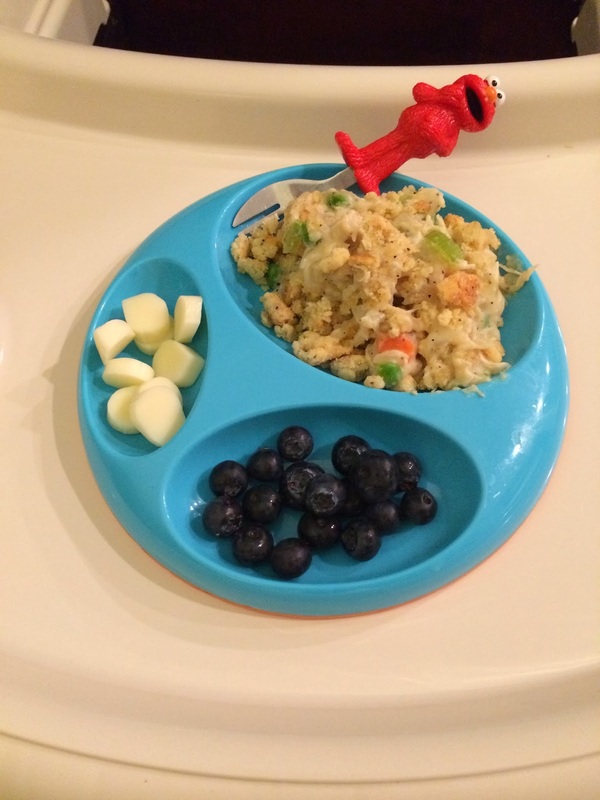 Here's what my version looked like (on Lilly's plate - she hated it, but she hates everything, so I wasn't offended. Plus, I did get her to take two bites, so I consider it to be a victory! Seriously, will she ever be non-picky? It was so much easier when she was first eating solids and would eat any and everything I put in front of her! ), Not nearly as pretty as Mel's, SBI! I have made this recipe a few times now since I discovered it a few months ago and it is a BIG hit. The only thing I change is that I leave out the mushrooms because both Dan and I hate them (it's a texture thing for both of us, oddly enough). I am betting that they add a TON of extra flavor, but the fact that it is still delicious without them says something. Again, try it - I promise it will not disappoint! WEDNESDAY: White chicken chili, because there is apparently a chance of snow here in Raleigh?!?! This is actually the only recipe this week that is my own/not Mel's Kitchen. Again, holler if you want the recipe and I'll post it at some point. I wasn't going to do soup on Thursday since I'm doing chili on Wednesday (and Dan is about to be over soup, I'm betting, since it's all I've wanted to eat for what seems like this entire pregnancy! ), but I stumbled across this recipe and knew I didn't have a choice. I mean bacon makes everything better, but seriously, how delicious does that look? I'll report back on whether or not we like it. We're heading to Houston on Friday for the weekend which is why there's no plan for that day, but we normally eat out anyway. My in-laws will be here keeping Lilly, and the good news for them is that they'll have a lot of (hopefully) delicious leftovers to eat! *The only disclaimer I have to this wonderful website is that Mel's family is a lot bigger than mine, so I always seem to forget that her recipes make a TON of food. If it's something I can freeze, I usually follow the directions as stated, but a lot of times I'll cut things in half and we still have a ton left over. Just something to keep in mind! One thing I have learned from this "I will try to cook more" journey is that planning ahead is key. I guess I actually knew that before, but seriously. I know that the only way I will cook is if I plan all of my meals for the week and grocery shop prior to Monday. Even if I accomplish that, there is still a lot of prep work to be done. Most days I don't get home from work until 5:30 pm and we shoot for a 6:30 pm dinner (and we eat together as a family I'd say 95% of the time). By the time I get home, talk to Carney about Lilly's day, get my things put away from work and get changed, there is not a lot of time left to cook dinner. If I've planned ahead on meals, a lot of times I will do whatever I can the night before after L goes to bed (usually this means chopping veggies in advance or something of that sort). Like I said, a lot of work, but worth it. This is definitely a work in progress (last week we only had a home cooked meal one night and it's only because Chef Dan made it), but I am at least working at it and trying to make it part of our routine. Keep those new recipes for me to try coming, I love getting all of your suggestions! Hope your Monday was great. Off to bed for me - Daylight Savings has taken it's toll and I have not been able to sleep past 6 or 6:30 in a week. Ridiculous, I tell you!